One cup contains 80 calories and 2 g of dietary fiber. 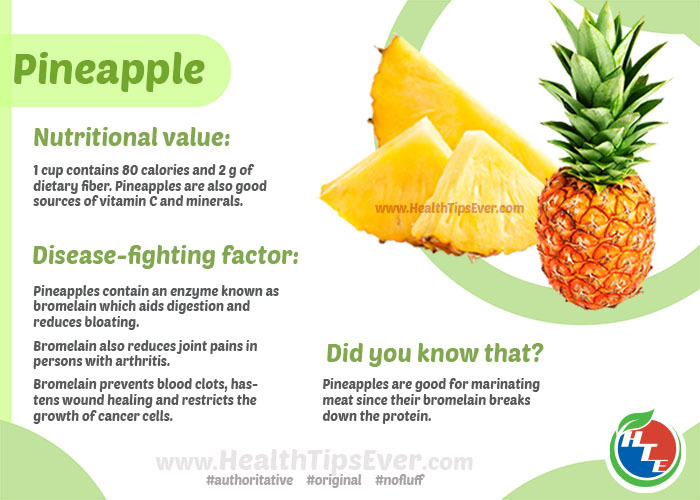 Pineapples are also good sources of vitamin C and minerals. Pineapples contain an enzyme known as bromelain which aids digestion and reduces bloating. Bromelain also reduces joint pains in persons with arthritis. Bromelain prevents blood clots, hastens wound healing and restricts the growth of cancer cells. Pineapples are good for marinating meat since their bromelain breaks down the protein.